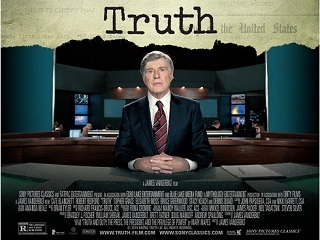 CBS Evening News scandal flick opens this weekend in the U.K.
Rather exited CBS in 2005, a year before Gerard Butler became a star via a groundbreaking green-screen movie about those same Spartans. And while Truth opens this weekend in the U.K., Butler’s latest, London Has Fallen, will be playing on U.S. screens. For his part, Rather continues to astutely view from the aisle a new era of news gathering, one that some might dub: Journalism Has Fallen.